The state's poor image among CEOs and its brutal economic decline have occurred despite the efforts of the MEDC's economic development staff and growing list of programs. Clearly, the MEDC has failed in its mission to "create and retain good jobs and a high quality of life" for Michiganders, a conclusion reinforced by our findings on the performance of MEGA, the Michigan Broadband Development Authority and Michigan Film Incentive program. The earlier "Literature Review and Analysis" and our own research findings indicate that the MEDC's problems are unlikely to go away. Moreover, the rationale for government economic development programs appears flawed. Consider again the three reasons supporters of government economic development commonly give for programs like the MEDC's. The view that government can "create" new jobs where they may otherwise not exist. The empirical evidence on state economic development programs indicates that they fail to create net new jobs regardless of where they are tried; the problem does not exist only in Michigan. On balance, government does not appear able to create net new jobs over time with targeted tax and subsidy programs. There are probably several reasons for the failure of economic development programs. First, the money that state government gives to some businesses must be taxed from other businesses and residents. This process cannot enrich both sets of people. Second, there is a middleman in this transaction — a government agency — and it adds to the cost of the program, reducing the net benefits the agency might provide by taking money out of the hands of existing Michigan job providers. In other words, one of the opportunity costs of an economic development program is not letting business owners keep more of what they earn. As we also noted earlier, it is difficult to choose winners and losers in the marketplace; professional investors frequently have difficulty outperforming average market returns. As we have indicated in our review of the MEDC's performance in several areas, there is no sign that MEDC officials have special insights that allow them to invest public resources in ways that will provide unusual market returns. This increases the chance that tax money taken from other businesses and individuals will be spent less productively than it would have been otherwise. Moreover, there may be a cost to the state's economy in encouraging "rent-seeking" behavior, as opposed to the generation of new wealth. Finally, it appears likely that state officials will ultimately use these tools for political ends, not economic ones. This lowers the probability that development incentives will create jobs, however well-intentioned the programs may be. The view that government can prevent the "theft" of existing jobs. If government officials are not especially good at picking winners from losers in the marketplace, it does not follow that the "theft" of a company will help the "thieving" state. Texas, for instance, may "steal" Michigan jobs away with economic development incentives and actually produce a net loss for Texas' economy, since the incentives are frequently very costly. This is especially true if the company had already planned to move to Texas regardless of what incentives it received, but pitted the states against each other to induce them to bid up the size of their fiscal rewards. On balance, government probably cannot prevent the "theft" of existing jobs in most cases. Businesses may choose the locale best suited to them independent of any economic development incentives, since those incentives are finite and sometimes uncertain, like a MEGA tax credit. The concern that dropping state incentives would result in "unilateral disarmament" is overblown. Perhaps the best answer to that concern came in a 2003 Detroit News article about MEGA titled "Tax Breaks Shortchange State." In it, University of Iowa economic development scholar Peter Fisher responded to the notion by arguing, "Of course you can unilaterally disarm when you're talking about an incentive — like the MEGA tax credit — that isn't very effective anyway." The view that government programs can redress "market failure." No matter how well-intentioned state policymakers are, they rarely have unique knowledge at their disposal to help identify and solve alleged market failure. The Broadband Development Authority, discussed earlier, is a good example. State officials believed they could use the state's taxing power to address perceived problems with high-speed Internet access. Unfortunately, they erred badly, and the state was ultimately forced to abandon the program after spending more than $14 million. Ironically, Internet access proved to be a problem that the market addressed more quickly than the Broadband Development Authority could ever have hoped to. Michigan has a long history of similarly failed public projects. In the 1840s, Michigan Gov. Stevens T. Masons convinced the Legislature to invest heavily in canals and railroads, only to sell or close them following heavy losses. More recently, in the 1980s, the state invested in Flint's "AutoWorld" amusement park, which subsequently shut down in less than two years. The MEDC likewise invested $1 million in a Kalamazoo grocery store in 2002, only to see the store close within six years of its opening. No matter what policymakers conclude about market failure, they should recall the possibility that government will fail worse, and that the cost of this failure will now be borne by every state taxpayer, including many who create jobs. Hornbeck, "Tax Breaks Shortchange State: $1.4 Billion Business Program Gets Minimal Payback in Jobs." Burton W. Folsom, Empire Builders: How Michigan Entrepreneurs Helped Make America Great, (Rhodes and Easton, Traverse City: 1998), 45-47. Montemurri, Patricia and Sylvain, Rick, "AutoWorld Closing Indefinitely," Detroit Free Press, January 12, 1985, 1A. "North Park Street Plaza - Northside Association for Community Development," Journal of Housing and Community Development 63, no. 4 (2006) and Kathy Jessup, "Kalamazoo City Commission Earmarks Money for Northside Grocery Store," The Kalamazoo Gazette, June 16, 2009. 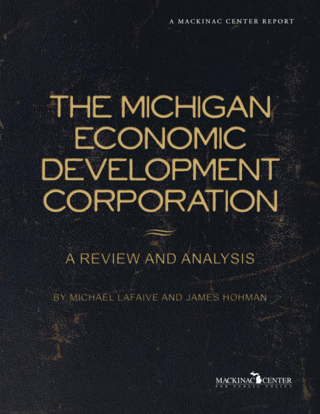 Eliminate the Michigan Economic Development Corp.